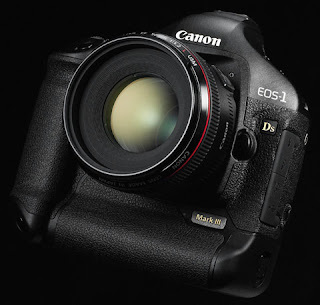 The heft but powerful Canon EOS-1Ds Mark III has just been launched in the Korean market. The Canon EOS-1Ds Mark III has a whopping 21 mega pixel 35mm CMOS sensor, dual DIGIC III processors which allows you to shoot up to 56 frames. The Canon EOS-1Ds Mark III also has an auto focus, 19 cross type sensors, 26 focus assist points, ISO 100-1600 (expandable to L:50 H:3200), and a 3 inch 230K pixel LCD. Now that's a powerful camera for a stalker to have!